Please note the change in the post title to "Revolution". This has now moved beyond protests, beyond riots, and looks like a full blown revolution. How it will end is unclear, but my support for what ever it is worth is with the people fighting for freedom. A poem from the night before to prepare for the coming day. It is subtitled in English. Read it as you listen to the people crying out in the background. Authorities tried to blocked off access points to try and prevent the protesters from gathering. Protesters did manage to gather, but generally in smaller pockets. The larger pockets were a lot less green the usual. In order to make it through the access points the protesters likely discarded anything the guards would recognize as being part of the protest. The protesters were met with tear gas and water cannons along with the now common batons. Shot have also been fired into the crowd (http://news.bbc.co.uk/2/hi/middle_east/8110582.stm). There are also reports of some agent (chemical?) being dropped from government helicopters on Twitter, but I have not found any video or independent source verification. There were also rumored sightings of a Tank. Fighting has been fierce with some protesters chanting "Death to the dictator!" (http://apnews.myway.com/article/20090620/D98UESTG0.html). Other chanted "Marg bar Khamenei" which means "Death to Khamanei". This one gives you a real sense of the panic as the person with the camera is running with the protesters as shots are being fired in the background. There have been reports of dozens killed with hundreds of people wounded and some people are saying the police are waiting for the injured at the hospitals. The video shows there is at least one death, a young lady who probably did nothing more wrong then stand up for freedom. Here the protesters try to fight back with at least one paying the ultimate price. 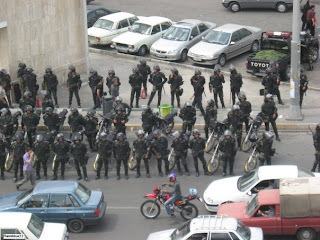 It appears the protesters with cameras and cellphones are being targeted in particular (http://niacblog.wordpress.com/2009/06/20/the-latest-from-iran-saturday). There were early reports of an explosion in the 'Tehran mausoleum of Iranian revolutionary leader Ayatollah Ruhollah Khomeini' from a suicide bomber (http://www.khaleejtimes.com/darticlen.asp?xfile=data/middleeast/2009/June/middleeast_June622.xml§ion=middleeast&col=), but it appear that was a hoax from the government (http://www.huffingtonpost.com/2009/06/13/iran-demonstrations-viole_n_215189.html). Mousavi did not say much for a while and the thought was that he was threatened into silence (http://www.guardian.co.uk/commentisfree/2009/jun/19/iran-election-mousavi-ahmadinejad). Mousavi then came out strong basically saying he was prepared for martyrdom and calling for a general strike across the country if he is killed or detained. Mark Steyn explains (to Obama) that "Neutrality Isn’t an Option" (http://article.nationalreview.com/?q=MDlhMmZmY2I1MjI0MTZlNDBhZmI3N2Y3ZDk2ZGZlYjA=). Obama's job approval rating has slipped to a new low at 58%, though it is unclear how much of that is directly from his response (http://www.gallup.com/poll/121028/Obama-Job-Approval-Slips-58-First-Time.aspx). Pressure was growing on Obama to act more forcefully (http://online.wsj.com/article/SB124546148508933437.html). And then he went and got ice cream ... seriously (http://blogs.abcnews.com/politicalpunch/2009/06/fathers-day-for-the-obama-girls.html). Some people think it was less then appropriate (http://patterico.com/2009/06/20/contrast-iranian-protestors-shot-as-obama-goes-for-ice-cream [via http://pajamasmedia.com/instapundit/80504]). Mousavi may have sent a letter to Obama. Copy at http://pajamasmedia.com/michaelledeen/2009/06/20/sunday-morning-in-iran-a-letter-from-mousavis-office. The Revolution will be [is being] Tweeted (http://www.reason.com/news/show/134247.html). More twitter stats at http://bloggasm.com/tweets-coming-out-of-iran-are-retweeted-an-average-of-578-times.